The 2018 Spokane Ag Expo and Pacific Northwest Farm Forum is this Tuesday through Thursday, February 6-8 at the Spokane Convention Center. 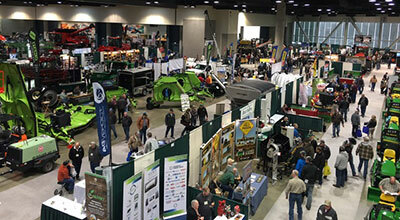 The largest farm machinery show in the Inland Northwest will host almost 300 exhibitors and conduct 35 educational seminars and forums relating to agri-business from large-scale operations to small acreage farms and ranches. Every foot of the 120,000 square foot exhibit hall will be ready to welcome over 5,000 visitors. For a complete time and topic schedule of the 35 seminars, visit their website at www.agshow.org and click on 'attendee information'. Ticket information also available on the website. 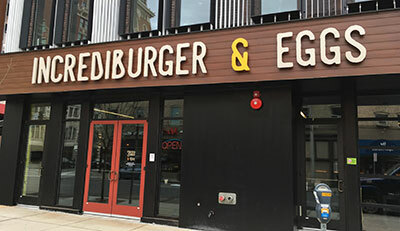 Incrediburger and Eggs is part of nationally renowned Eat Good Group which includes Wandering Table, Yards Bruncheon, Eat Good Cafe, Republic Kitchen + Taphouse, Farmhouse Kitchen and Silo Bar, Gilded Unicorn and Le Catering Co. They feature all types of handmade burgers, egg sandwiches, snacketizers and adult beverages created using as much local producers and farmers as possible. The phone number is 509-443-4215 and the website with the complete menu is incrediburgerandeggs.com. Early Life Speech & Language, which provides research-based speech therapy for children and toddlers aged two to seven who exhibit communication delays, has moved to 506 W. 2nd Avenue. Formerly known as RiteCare of Washington, Early Life Speech & Language has been providing clinical services for children in Seattle, Spokane and other locations in Washington state for more than 30 years, with the generous support of Scottish Rite Masons and other donors. The phone number is 509-838-2310 and the website is www.earlylifespeech.org. The 2018 Spokane Auto Show, sponsored by the Spokane New Car Dealers Association, is this Friday, Saturday and Sunday, February 9-11 at the Spokane County Fair and Expo Center. 27 auto manufacturers will be exhibiting the latest in automotive technology; self-parking cars, back up cameras, collision warning systems, WiFi and more. Local dealers will also offer Special 'Auto Show' Pricing. There will be a special appearance by Batman and his replica of the 1960's Batmobile signed by Adam West & Evil Knievel, a real NASCAR Simulator and special appearances by a variety of Super Hero's. Show hours are Friday 10am-8pm, Saturday 9am-8pm, and Sunday 10am-6pm. For more information, visit the website at www.spokaneautoshow.com. The 11th Annual Kootenai County Commercial Market Forum will be held at the Salvation Army Kroc Center in Coeur d'Alene this Thursday, February 8 from 7:15-11am. Reservations are required. The Coldwell Banker Commercial team will present a reflection on 2017's market activity in Kootenai County and share predictions for the coming year. Topics covered will include Multi-Family, Office, Retail, Industrial, Land, and Investments. The special guest speaker will be JobsPlus President Gynii Gilliam and Ryan Nipp from Parkwood Business Properties will be covering the Office sector. Because There Is Hope's 14th Annual Cinderella Tea & Fashion Show Fundraiser is taking place to raise money to provide temporary housing for cancer patients traveling to Spokane for treatment. The Cinderella Tea will be held on Saturday, February 24 at the Spokane Convention Center from 10:30am to 1pm. Doors will open at 9:30am to view the incredible auction and raffle items. Coffee, tea and scones will be offered before the program starts. Lunch will be served. Tickets are $40. The Tea is open to the public. To learn more or purchase tickets visit: www.becausethereishope.org/events. The 7th Annual Leadership Lights the Way Gala was held last Saturday, January 27 at Northern Quest. More than $55,000 was raised to support scholarships for the youth and adult classes of 2019, program support for youth programs and grow their endowment. For the second year in a row, the event raised over $50,000. Congratulations to the award winners. Rob McCann was the recipient of the King Cole Luminary Award and Yvonne Smith received the Alumni Lifetime Achievement Award. For more information on Leadership Spokane, visit the website at leadershipspokane.org. A fundraiser for the Spokane Humane Society, called 'Puppy Love' will be held at Maryhill Winery in Kendall Yards, 1303 W. Summit Parkway, Suite 100, on Tuesday, February 13 from 5:30-8pm. Cost is $15 at the door. Enjoy a glass of wine and light foods while you bid on romantic gifts, getaways and treats at the silent auction. Proceeds benefit The Spokane Humane Society. Spokane Preservation Advocates will be holding a 3-session workshop this month regarding the rehabilitation of historic buildings, including barns and old school houses. The workshops will be held at The Woman's Club, 1428 W 9th Avenue on Tuesday, February 6, 13 & 20 from 6-8pm. These three informative workshops will discuss how local homeowners, developers, and business owners have taken on the adventure of transforming barns, schools, and other historic structures, giving them a new life and purpose. For more specific information on workshops, costs and more, visit www.spokaneprreservation.org. image State Bank Northwest President and CEO, Greg Deckard, has announced that former Farmington State Bank President, John Widman, has joined the State Bank Northwest Team as Senior Vice President/Director of AgriLending. John brings a wide experience in team management and relationship banking as well as his 30 years of expertise in agriculture and finance. He is a graduate of Washington State University, with a degree in Agricultural Mechanization, and has 20 years of community banking experience, so he has deep roots to the foundation of State Bank Northwest. He will be based at State Bank's Garfield branch. The Inlander's Restaurant Week is happening February 22 through March 3 throughout Spokane and North Idaho. All 107 of the participating restaurants' menus are online at InlanderRestaurantWeek.com so you can start making your reservations for the highly-anticipated 10-day eating extravaganza.